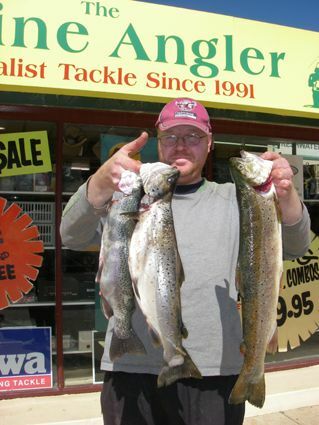 Headlines: Both lakes continue to produce some really good fishing with all methods. All lakes have risen this week with Eucumbene rising over 1% since last week. With the continued snow melt Eucumbene should continue to rise well into Spring. Other launching in Eucumbene is available at Old Adaminaby, The Dam Wall and Buckenderra. 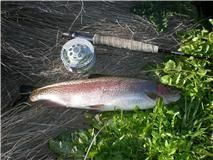 Lake Eucumbene:- Fly reports have been good with some nice fish around Buckenderra and the Dam Wall. Late afternoon searching with Streamers and small wets. Nightime fishing will improve with the warmer weather we are experienceing this week. A few early Midge pupa will be hatching nd the fish will be onto these. There will be some good post spawn browns starting to cruise the edges looking for food shortly. Any areas with some structure or bankside growth should have a few poking around with the rising water. 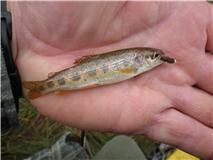 Rainbows can be found schooling in the Dam wall area at this time of year and are suckers for a Wooly Bugger, Matuka, Wooly worm and Epoxy trout fry pattern. Best areas to look at are Seven Gates, Dam Wall, Buckenderra and Old Adaminaby. Lake Jindabyne:- Not a lot of change to the reports Jindabyne. The fishing has continued to be excellent with polaroiding and searching both producing good fish. There have been both Browns and pre spawn Rainbows in many areas. The Eastern shore early in the day and the Western shore in the early to late afternoon are the best options. If you have a boat that will give you more shoreline access. Don't despair if you are only on foot, as with a little persistence, you can still find fish. Best flies to use on fish that are stationary or moving slow are small #14 and #16 Midge Pupa, Stick Caddis, Cased Caddis, Black and Peacock Spider. If the fish are cruisers and not laying doggo try a larger # 8 or #10 Woolly Bugger, Jinde Specials, Olive Matukas, or Woolly Worms. Leading the fish by a considerable amount can be important, especially if it is really calm. Lake Tantangara :- No reports access is difficult due to snow. 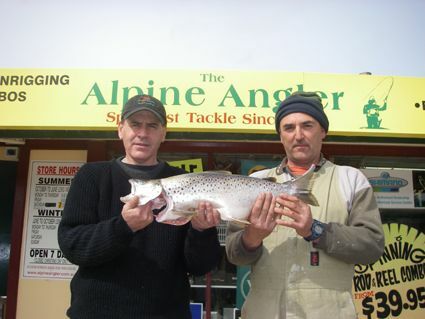 Eucumbene:- Trolling reports have been a little hit and miss. Most anglers are catching some fish but not always in big numbers. Big Rainbows are the main target at present both getting deep and on flatlines depending on the conditions. Working deeper open water will find some quality fish. Browns will start to make an appearance as they look for food after spawning. Deep diving minnows will get down to fish when trolling in close and this is where you should find the Browns. Alex Tango lures in some new Yabby colours would be good in theis scenario, Stumpjumers, Bennett Deep and Ultra Deeps, Rapala Taildancers and Glass Shad Raps, Oar-gees, and Cultiva Mira Shads are other good lures to use when targeting browns on the troll. Tassies and Alpine Cobras will also take the occasional brown near the surface too. Best to cover you depth spectrum with a few differnent types and stlyes of lures. Best areas to look at this week are the Dam wall, Main basin, Buckenderra and Grace lea. Jindabyne:- Not many reports have come in from Jindabyne over the last week. The trolling will continue to be good, with the Eastern shoreline having been the most consistent over the pst two weeks. Spinning from the shore or boat with plastics and minnows has been deadly on the fish as well. *Angelo Fischett and Joseph Garcia had a great weelend with this absolute cracker of a brown from Buckenderra. The fish weighed 3kg cleaned and was caught on a scrubworm. They also landed four rainbows and dropped two as well. Powerbait and Scrubbies were the baits used. *Jimmy Savitsky from Canberra (below)had a good session on the weekend at Kalkite. He landed two browns to 1.8kg and seven rainbows to 1.2kg. All fish were caught on Gulp Powerbait. Orange Pulp and Sherbert Burst were the two best colours. *The Sturgeon brothers also had a good night session on the weekend. 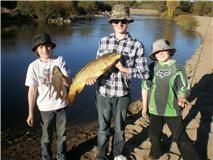 After finally deciding on where to fish, involving a round trip that included Old Adaminaby, they finally started fishing at Kalkite. First cast Matt hooked a good brown on a # 3 green celta but it got off. He did redeem himself with a nice fish landed a bit later on a Celta and also one on Chunky Cheese Gulp. Stuart caught two on Lime and Lemon twist Powerbait.